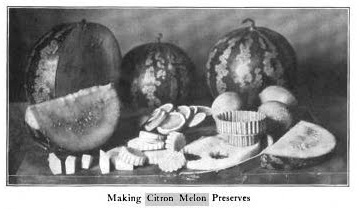 The melon cannot be eaten unprocessed but when cooked in sugar water it is candied and used in cakes, puddings, mincemeat, green custard; it's pectin will help other fruit jellies; a substitute for applesauce or pie/tarts filling; or pickled like watermelon rind. 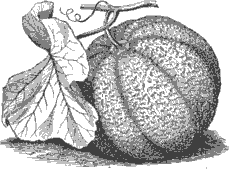 Mary Randolph's (Virginia Housewife, 1824) citron ice cream stated use when "very ripe" (the seeds are red) but others directed to use "just before the fruit reaches maturity: while still green yet well filled out." [Berry, 1907] The seeds are white in the enlarged picture as they are before ripe. "Take the rind of a large watermelon not too ripe, cut it into small pieces, take two pound of loaf sugar, one pint of water, put it all into a kettle, let it boil gently for four hours, then put it into pots for use." 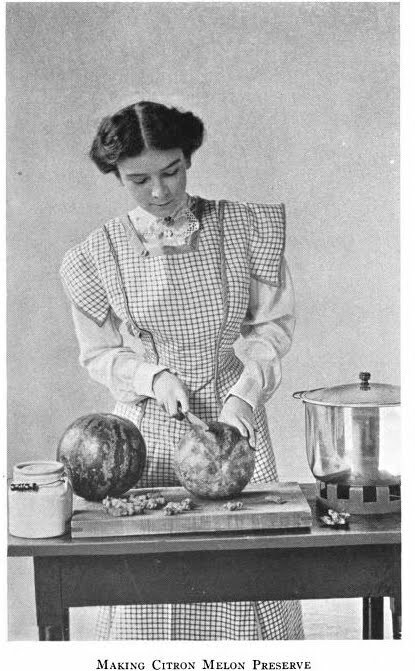 "Cut the finest citron melons when perfectly ripe - take out the seeds, and slice the nicest part into a China bowl in small pieces, that will lie conveniently; cover them with powdered sugar, and let them stand several hours—then drain off the syrup they have made, and add as much cream as it will give a strong flavour to, and freeze it. Pine apples may be used in the same way." The sugar causes the liquid to come out of the pieces which then is mixed with cream and sugar as needed to make ice cream. Both citron melon and pine-apple flavored ice creams were very good. "Peel off the green rind of the melons, cut them in halves and remove the soft centers. Then cut the fruit into diamonds, strips, or any fancy shapes preferred. Weigh, and for each six pounds of the prepared fruit allow one quart of water and one-fourth pound of ginger root. Clean and scrape the root, put all into a preserving kettle and place at the back of the stove, where the mixture will simmer for one and one-half hours. Meantime make a syrup, using five pounds of sugar for every six pounds of fruit and adding two cupfuls of water to the sugar. Remove the ginger root from the citron and, when the sugar is dissolved, pour the syrup over the citron and cook for one-half hour longer. Then skim out the fruit and spread on a platter, letting it stand in the sunshine or in the oven while the raisins and lemons are added to the syrup. Use three lemons and one pound of raisins. The lemons should be sliced thin and the seeds rejected. Cook until a rich, thick syrup results. Return the melon to the syrup, cook for fifteen minutes longer, then divide into jars and seal. Melon preserve is usually made with the melon cut in dice, but it is far more delicious when grated, and the syrup and flavorings penetrate quicker. Cook the grated citron melon in a rich syrup flavored with grated lemon rind and strained lemon juice. One half lemon to two cupfuls of sugar is a good allowance. "Quarter, peel, and cut into preferred size the pieces of melon. When weighed place in earthen jar; pour over them cold vinegar and let stand over night. Then drain and for every seven pounds of melons make a syrup of three pounds of sugar, a teaspoon each of allspice and cloves, a little grated nutmeg, and a few bits of stick cinnamon. Boil several minutes after commencing to simmer. Pour this over the melons; cover them and let stand over night. Repeat this twice, the last time simmering until melon is tender and translucent, though firm. Place in heated jars and pour the spiced syrup over them, then seal." "Cut and pare the melon; place in double boiler with no water or barely sufficient to wet the bottom layer of pieces, and cook till soft. Add sugar and lemon juice or other flavouring. This approaches apple sauce in flavour and consistency. To vary the flavour add, instead of lemon, or with it, barberry, cranberry, currant, or raspberry syrup, when the melon begins to soften." "Make as for apple tarts, using the sauce made as above." "Of the Melon there are two species in general cultivation,— the Musk-melon (Cucumis melo) and the Water-melon (Cucurbita citrullus),—each, however, including many varieties. Through the extraordinary facilities now afforded by railroads and ocean steam-navigation, the markets of all the cities and large towns of the northern portions of the United States, and even of the Canadas, are abundantly supplied within two or three days from the time of gathering: and they are retailed at prices so low, as to allow of almost universal consumption; well-ripened and delicious green-fleshed citron-melons being often sold from six to ten cents each." Citron. Green-fleshed citron. Green Citron. "Fruit nearly round, but flattened slightly at the ends, — deeply and very regularly ribbed; size medium, or rather small, — average specimens measuring about six inches in diameter, and five inches and a half in depth; skin green, and thickly netted, —when fully mature, the green becomes more soft and mellow, or of a yellowish shade; flesh green, quite thick, very juicy, and of the richest and most sugary flavor. It is an abundant bearer, quite hardy, and remarkably uniform in its quality. It is deservedly the most popular as a market sort; and for cultivation for family use, every thing considered, has few superiors. "Red-seeded Water-Melon (Pasfeque a Graine Bouge). "Why the apple-pie melon was ever said to resemble the apple in taste, “ to be as good as the apple,”… I cannot tell… Yet this melon has its place. This is where the apple is not. Properly prepared, it is passable; indeed, where nothing else of the kind can be had, many would call it good. It can be raised as easily as any melon, and care should be taken that it does not intermix, which it seems to have a special penchant for doing. Can be grown on a new place the first season, so that the settler can have "some sauce" the first year, and then on till apples come, when our old friend, like many of human kind, will be thrown aside. We have tested various methods of preparation. and have found the following the most convenient and the best: To 10 lbs. of the melon cut up ready for stewing, take 3 lbs of sugar or three pints of molasses, and one pint of good vinegar ; add spice of any kind to suit taste. Cook all together until the melon will mash soft. When cool, it is fit for use, or it can be kept about as well as apple sauce, as it rather improves with age. Emigrants to the west will do well to take a few seeds of this melon along with them, as it will till a vacancy which otherwise might remain void. H. T. Vose, Nebraska."